This is not the final presentation but it was ready for the day of dedication! 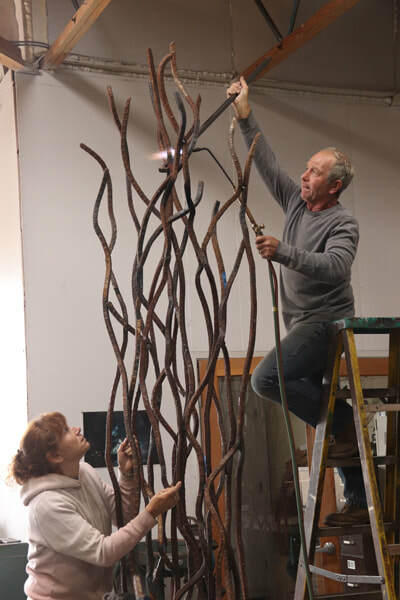 The sculpture will be set on a seven foot round cement base, painted with a stain to give the feeling of water, and have river grasses and boulders set around it. 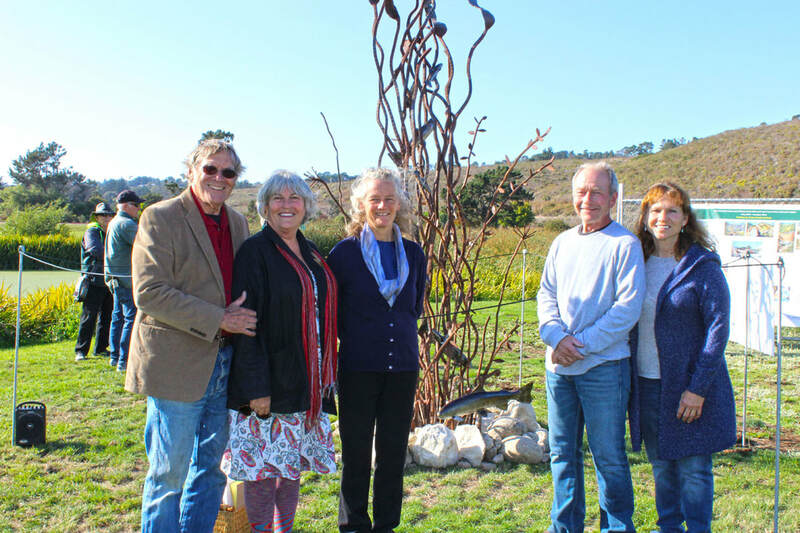 Richard Schrader, metalsmith of steelhead trout; Toni Henderson, graphic designer of the Big Fish Story; Paola Berthoin, Project Director; Fred and Lorie Saunders of Sculpture Works, Inc. fabricators of sculpture. 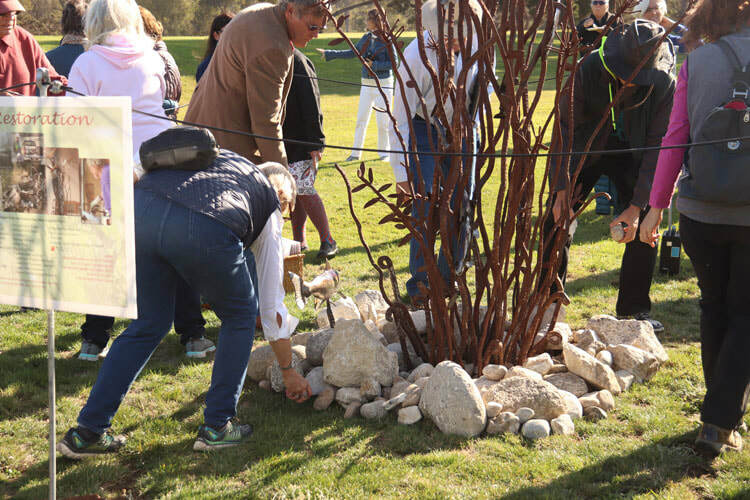 In honor of the river and watershed, community members placed stones from the Chinese Dam at the base of the sculpture at the end of the dedication ceremony. 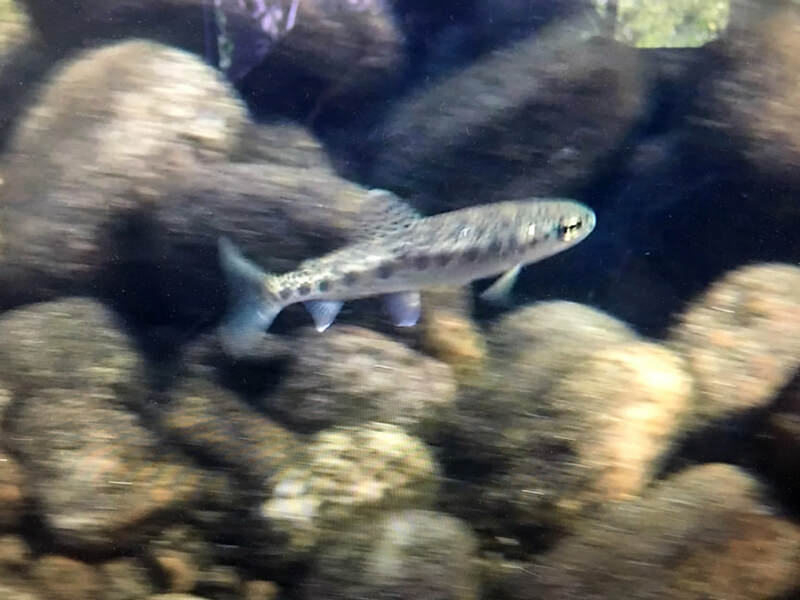 24" Steelhead Trout made from two pieces of ninety-four year old steel from the former San Clemente Dam. 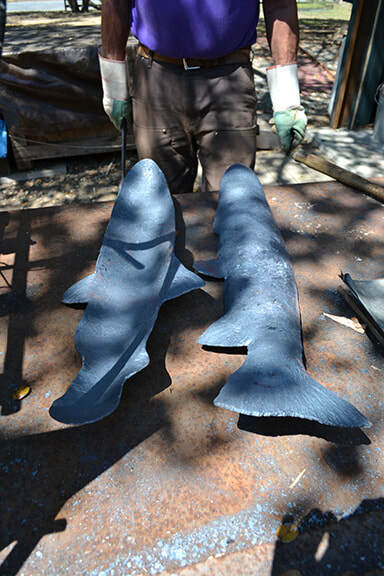 Refer to early postings of this project to see the metal before it became this amazingly sleek and beautiful fish! 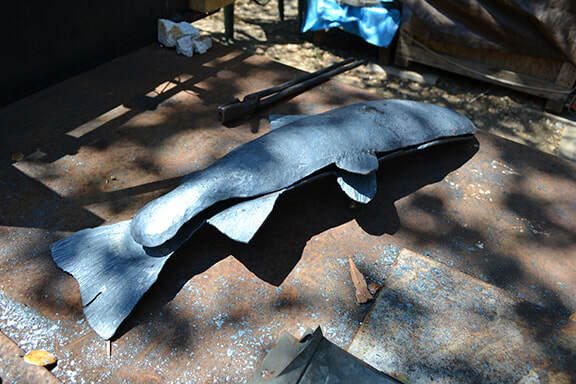 Here is the sculpture with the fish added..but not quite done yet! 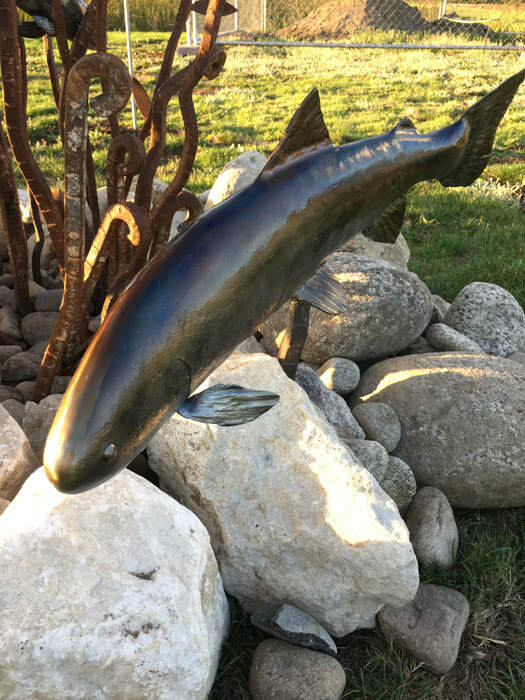 The sculpture was very well received at the West End Celebration..people expressing their amazement and appreciation for such a "gorgeous" sculpture! 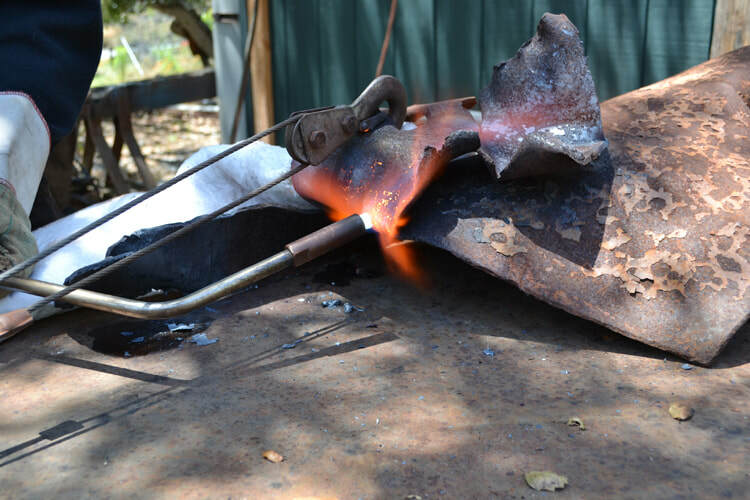 After the fish creation, Richard will be making the dragonfly and redlegged frog. 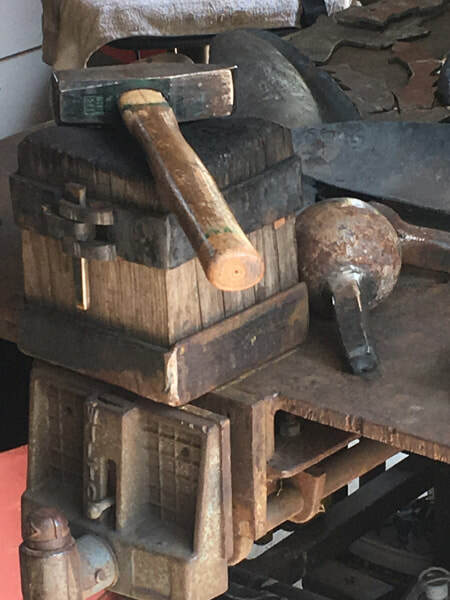 The tool on the right that has many round bars of metal on a metal stand was made from an old garage door coil destined for "the dump". 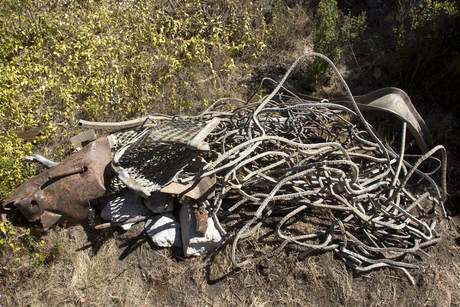 In the eyes and mind of Richard, that is certainly not trash! 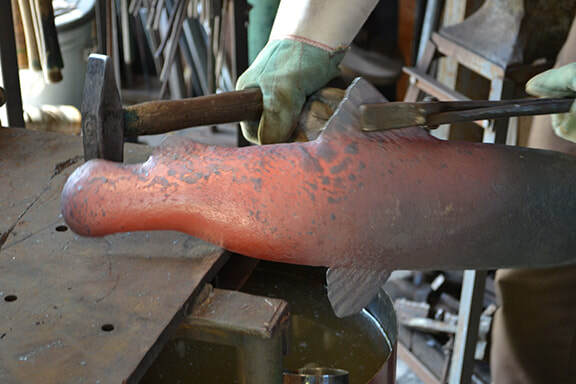 He created that particular tool to make the ribbing on the fish tails and fins. 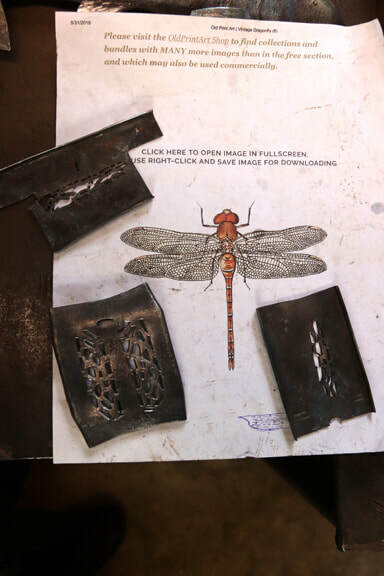 Here, Richard is determining the best way to create the wings of the dragonfly from flat metal from the dam. 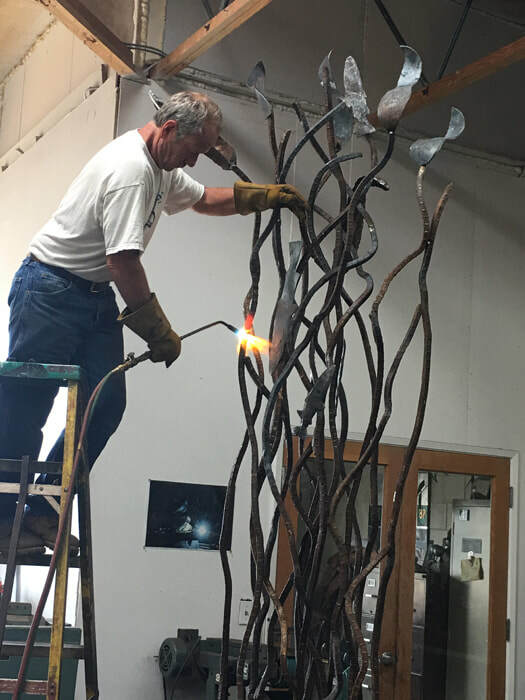 Last week, Fred worked on adding more willow branches and bulrushes (tule), bringing more movement to the whole sculpture. 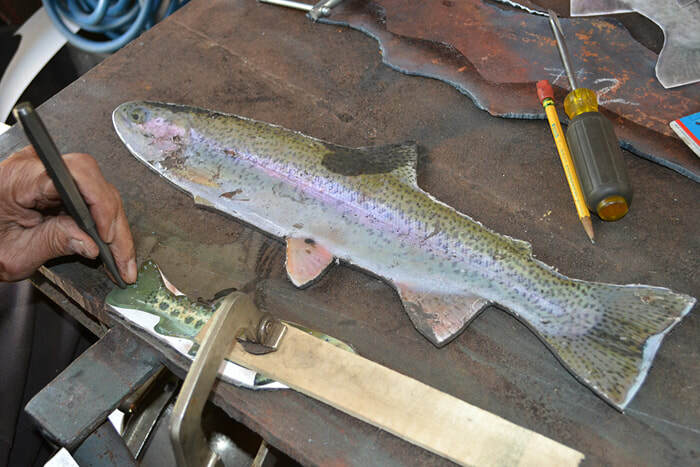 Richard continues to hammer out the metal to form the steelhead trout. 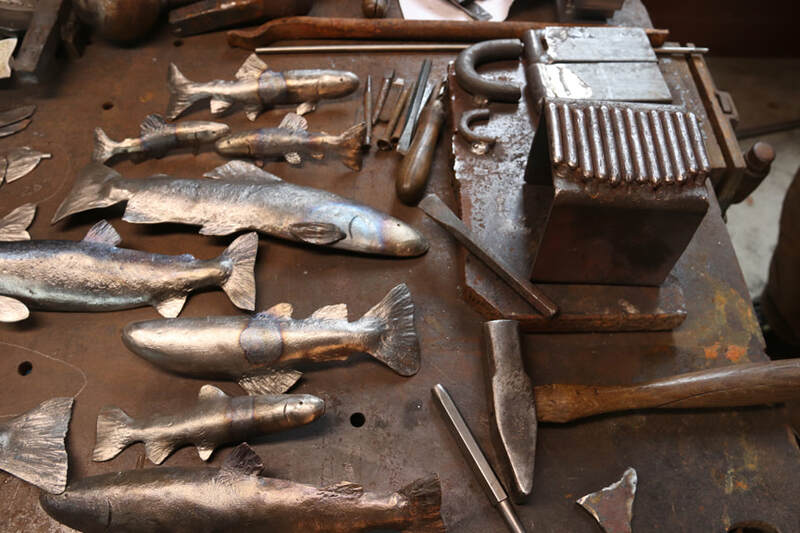 Quite impressive work as he also makes his own tools to do the forming of the bend of the fish, their fins and more! This coming weekend, if you are in the Seaside area, you can get a first hand view of the artwork on display at Fred's shop during the West End Arts Celebration. 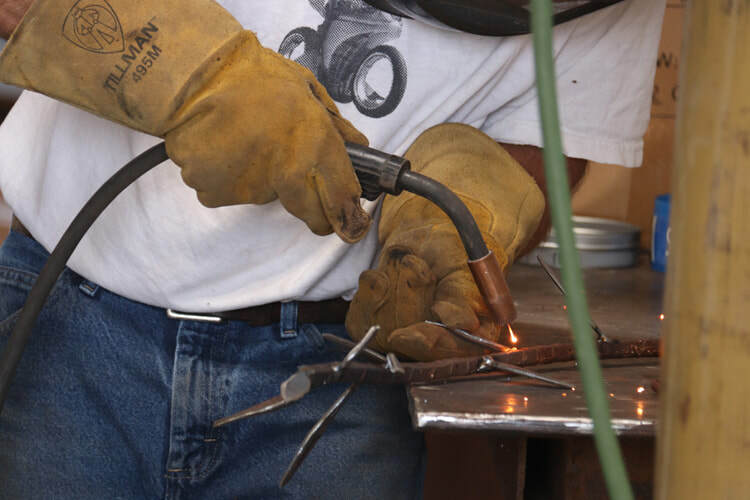 Heating the rebar to bend it in a different direction. 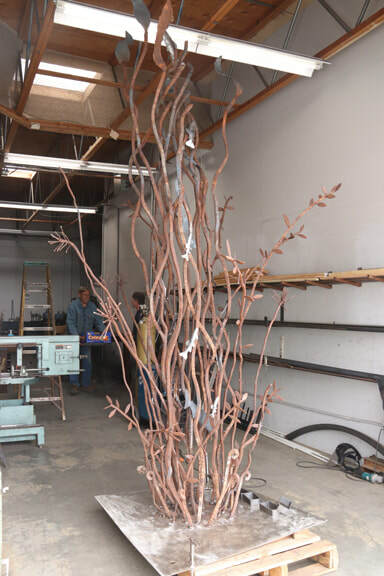 A few more willow branches and tule were added after this photo...soon the fish and redlegged frog and dragonfly will make it complete! Hammering half of the steehead just out of the forge. 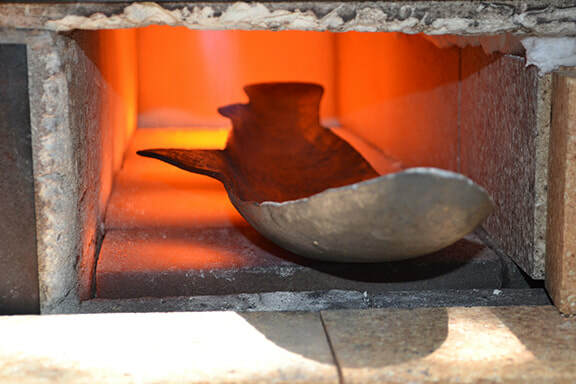 Richard sets the hot metal onto a concave wood block that has been soaked in water. 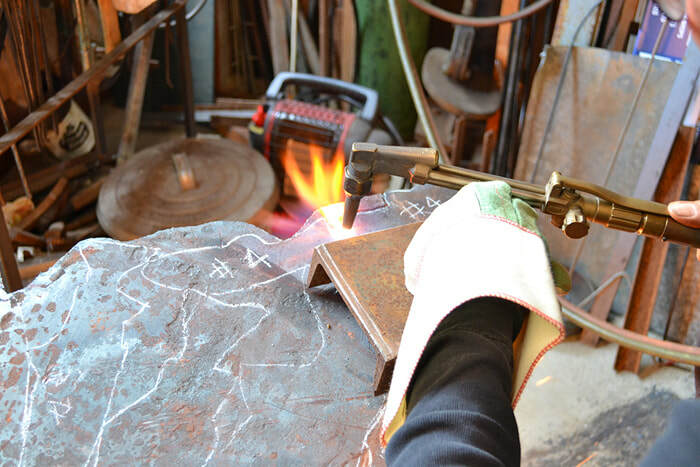 then he moves over the the anvil to hammer the metal out further. It all happens within about a minute or two...then the metal is too cool to work on. But, if you touched it with your bare hand, you would know it is still very hot! 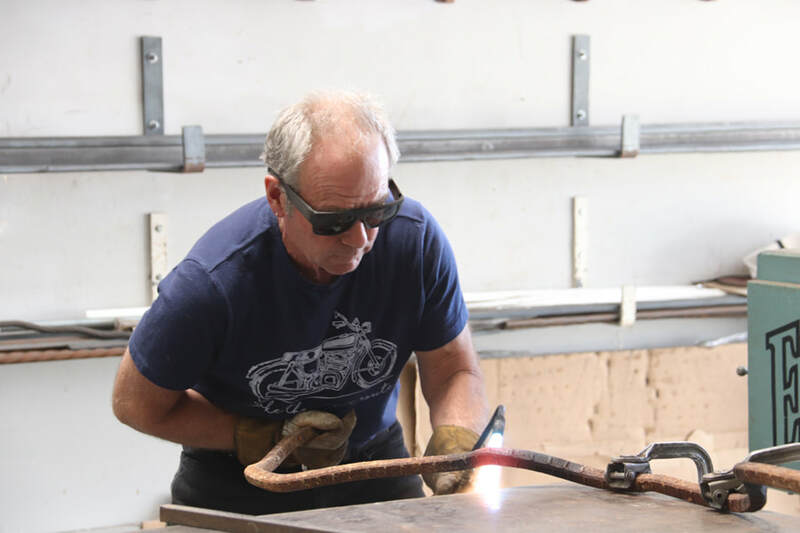 Richard hammering a fin out on a tool he created just for this purpose. It is made from an old garage door spring that was going to be taken to the dump. Ingenious! 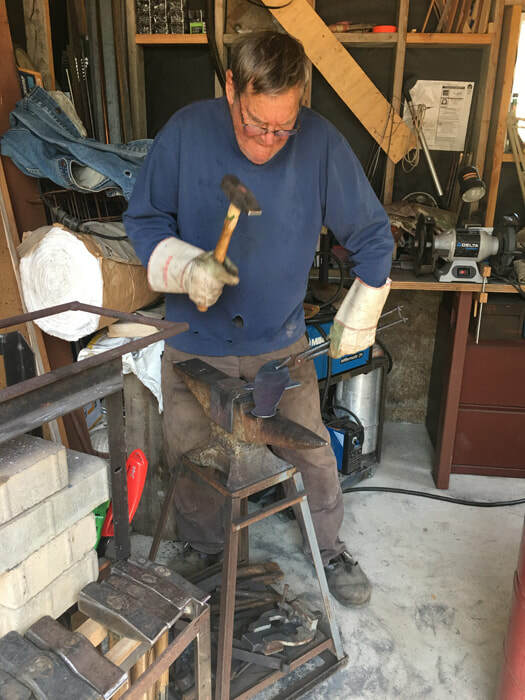 Richard also made this square block tool for hammering out the metal and the round metal ball on a piece of rebar, used to shape the fish. No need to go to the gym! 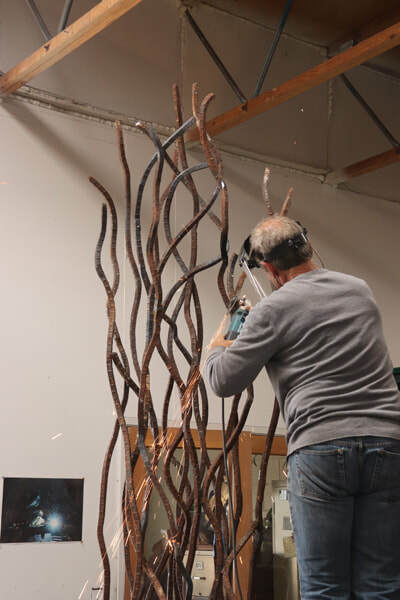 This week the kelp fronds to represent the ocean and the willow branches to represent the riparian habitat for the river have been added. Additional refinement on the spiral of the river was also accomplished. 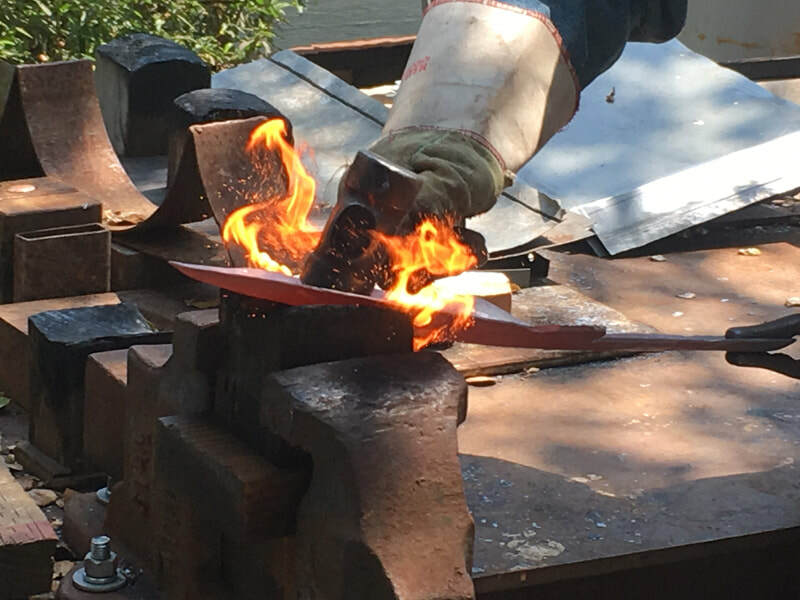 Richard continues to forge and fabricate the thirteen steelhead trout for the sculpture...and soon, a red-legged frog and dragonfly! Following are the photos showing these different aspects. Sculpture taking shape standing up! 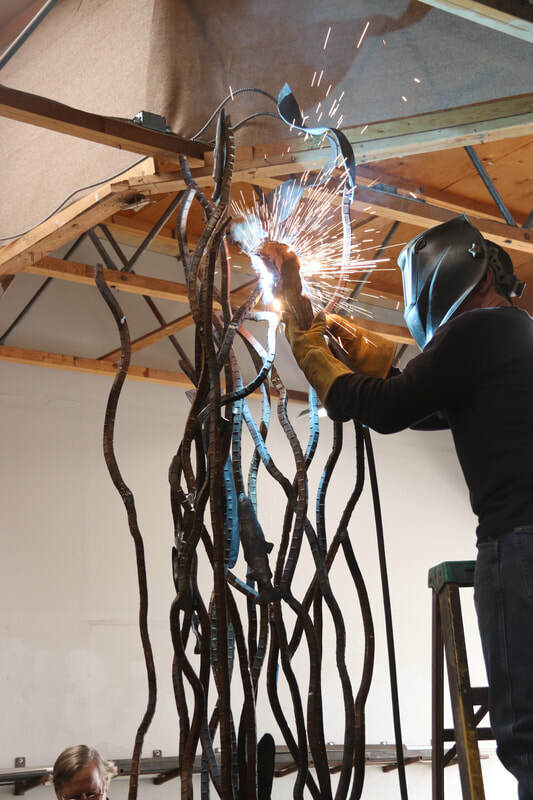 Below you will see new steps in the process of creating the Rebar Sculpture: Transformation in Restoration. 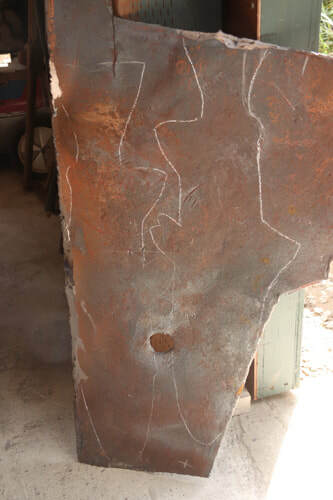 Working with this old metal is quite a challenge which is dictating how it is taking shape! 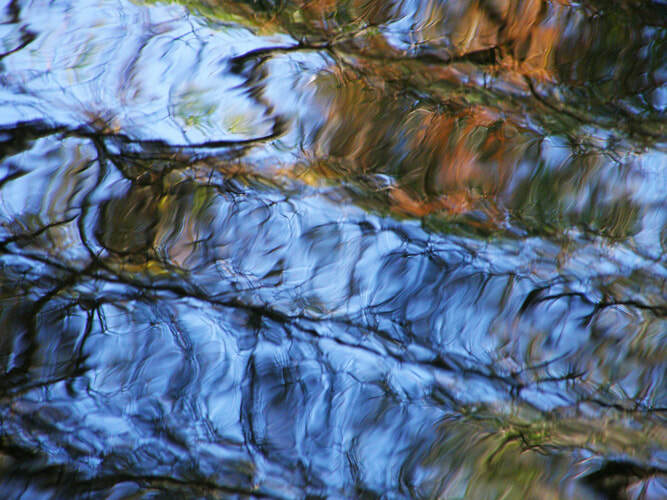 It is a process of building, then taking away, reshaping, bending, adding and reshaping again. 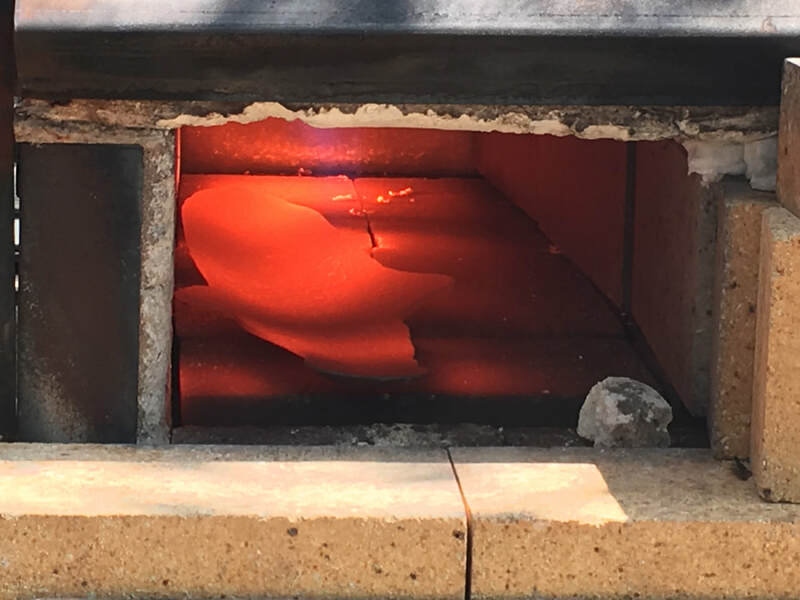 Bends in the metal are achieved by heating the metal 'til red hot then slowly pulling with a metal tool...it is slow going! 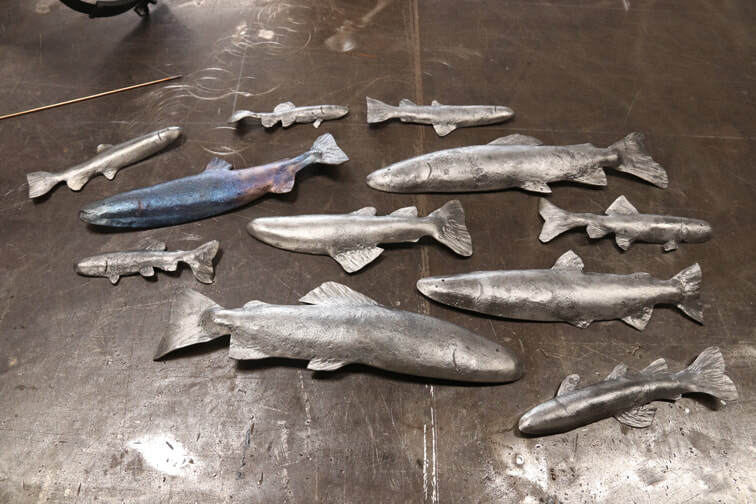 The fish have been cut out of the flattened metal and will continue to be refined in shape and texture and turn of the body...all with the allowances of the metal. 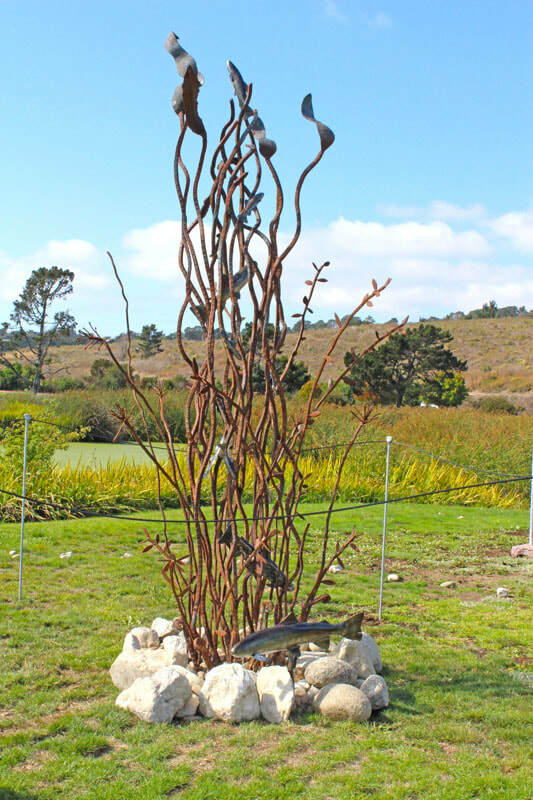 This shows the sculpture where we tested placement of the fish. 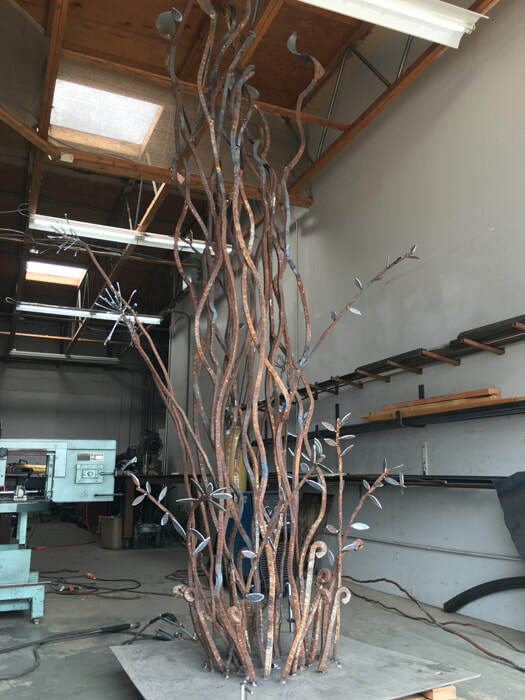 The second week we have started to remove and reshape some of the metal to form more spiral shape in the center,..a work in progress as seen below. 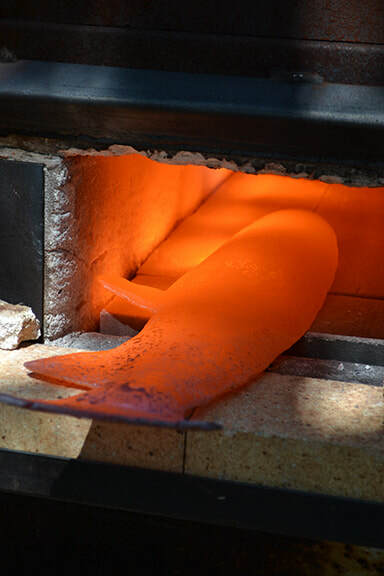 Heating the metal to red hot to bend a bit at a time. 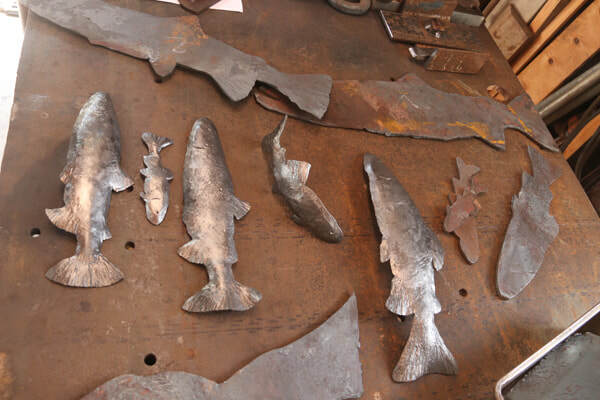 And here are a couple images showing the fish...drawn on the metal ready to be cut out...and fish below in various stages of formation. 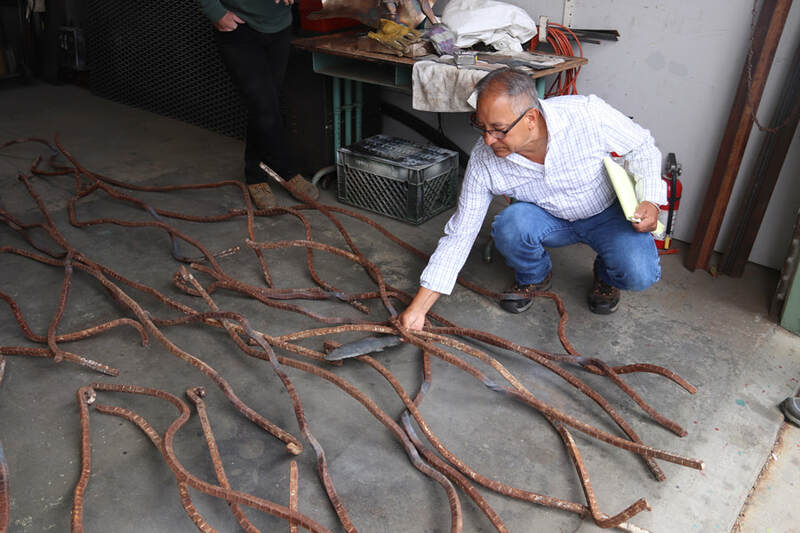 San Clemente Dam Rebar Sculpture Coming to Life! 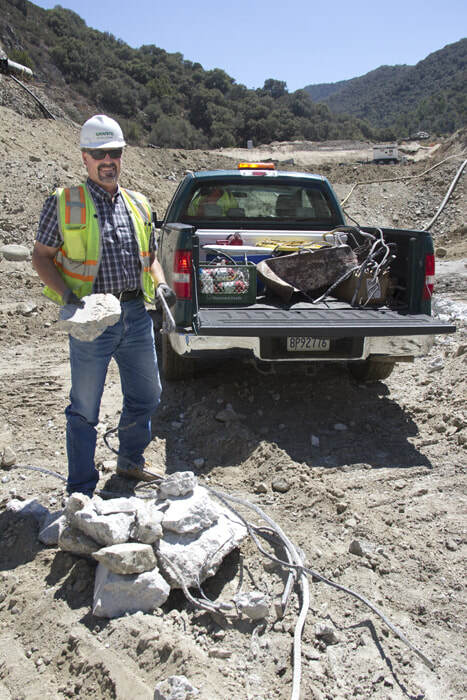 It has been almost three years since the San Clemente Dam came down. 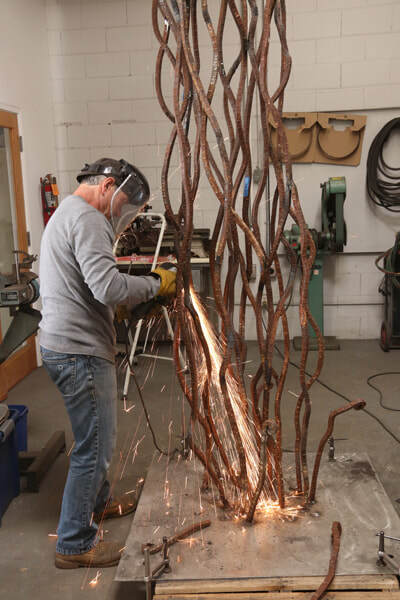 Now, the rebar I collected from the dam is coming to life in the sculpture. Below are some photos of that process. 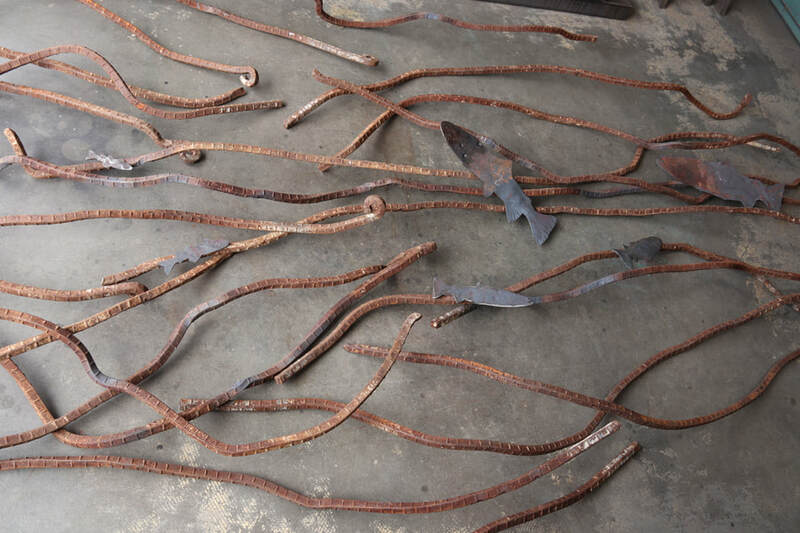 Rebar and other metal collected from dam at my home. 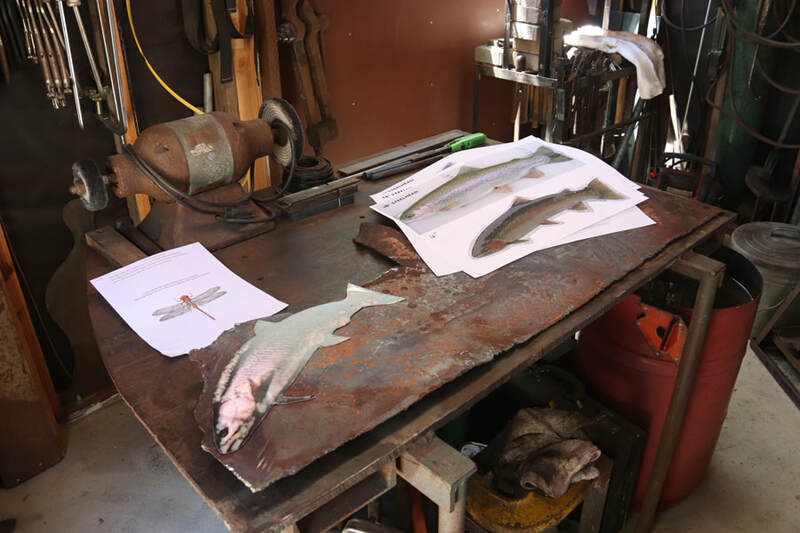 The flat metal on the left side is what Richard Schrader is using to create the steelhead trout, red-legged frog and dragonfly. 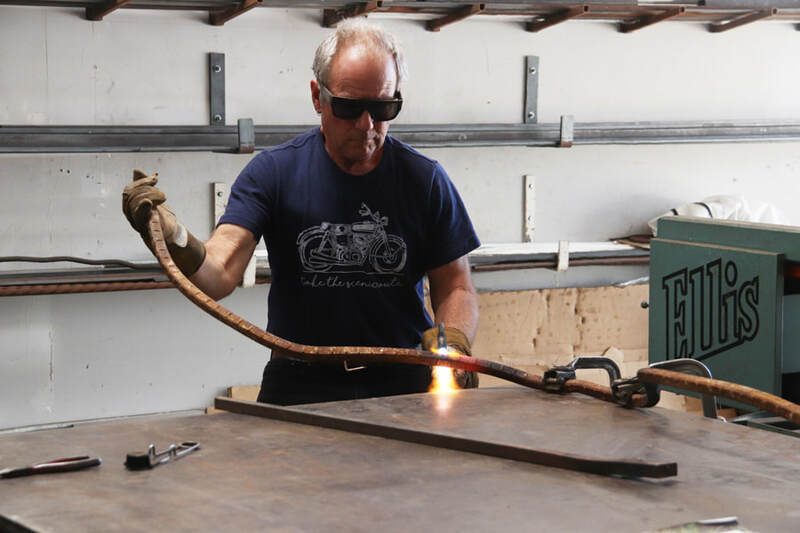 Richard Schrader unbending metal plate to create fish. 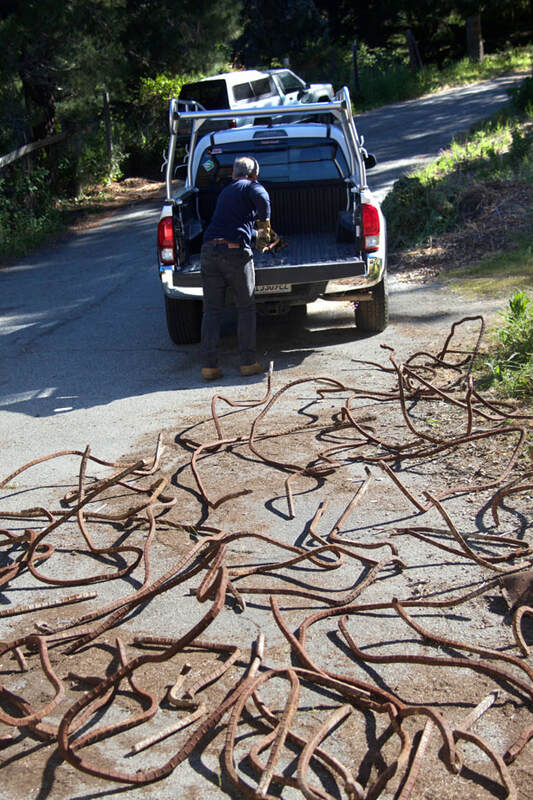 Rebar laid out with fish..first time to see the drawing of the sculpture coming to life! Thank you to all who have made generous donations to make this sculpture happen! Truly an historic endeavor. Stay tuned for more blog posts showing the progression of this creation. 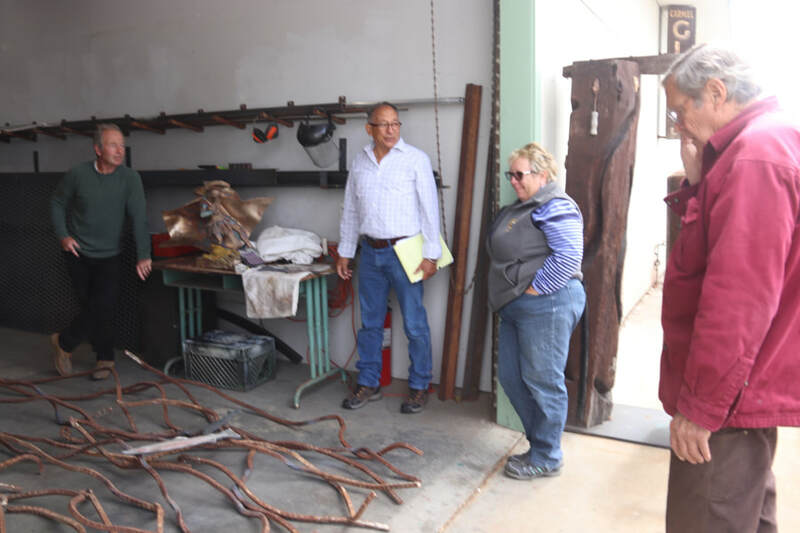 The sculpture is planned to be installed and ready for the dedication of the new Palo Corona Regional Park (former Rancho Cañada) on September 28, 2018. 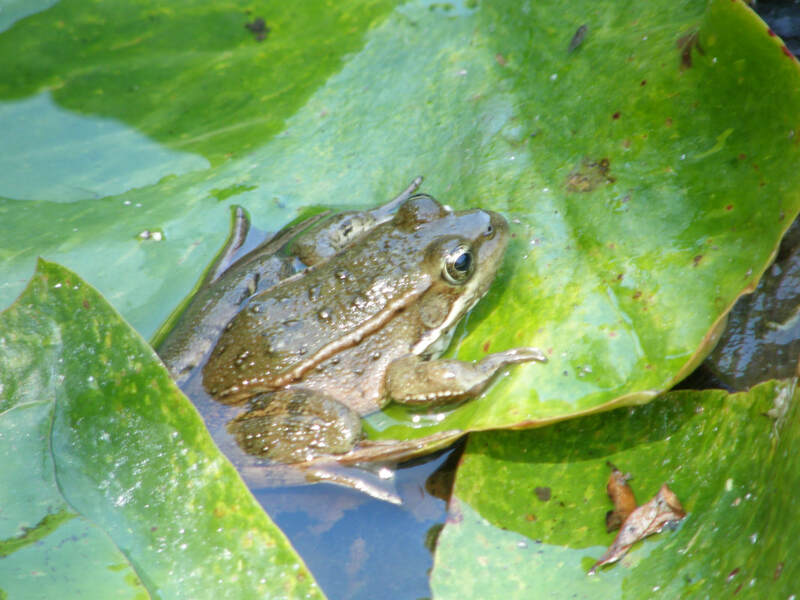 Mature Red-legged frog at my home pond, 2011. 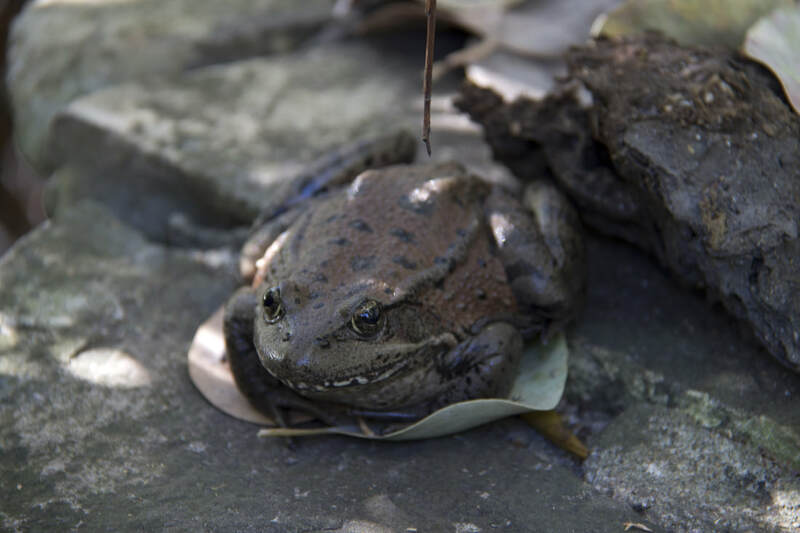 The red-legged frogs have been breeding and living here for at least eight years. On June 28, 2014, the CA Red-legged Frog became the official State Amphibian. 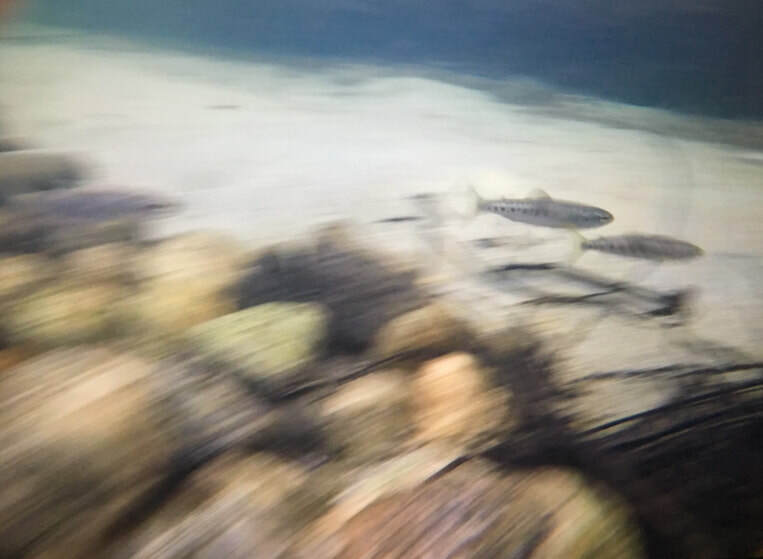 This came about through the persistent efforts of Save the Frogs! organization and Assemblymember Pérez and his staff; the students, teachers and administrators of Sea View Elementary School in Salton City; all the legislators who voted in support of this bill; and SAVE THE FROGS! 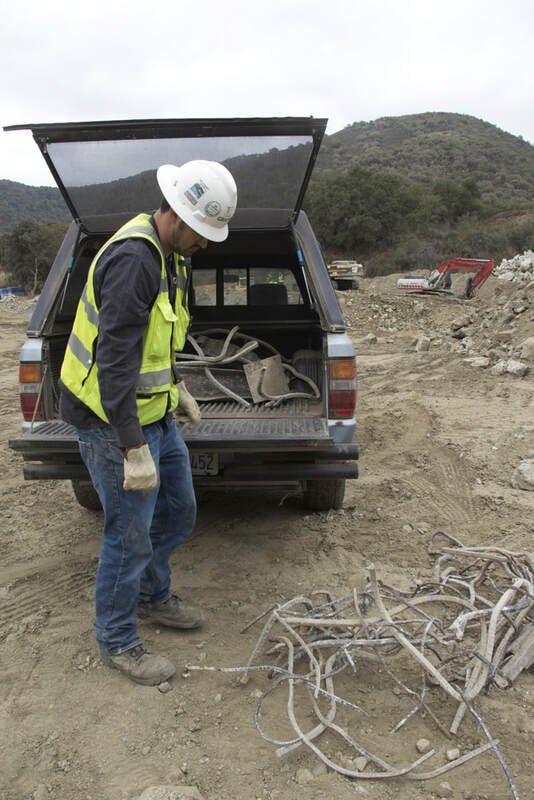 supporters who sent in letters of support on behalf of the California Red-Legged Frog!